We have porcupines where I live. I see their tracks from time to time, but I have never "met" one in person. Neither has my dog, which I am grateful for. Some dogs try to attack porcupines and end up with a mouth full of quills, and like with skunks, some dogs do this over and over and over again. They just never learn, and they cost their owners hundreds of dollars to have a vet carefully take each quill out of the poor dog's mouth. Your early drawings of porcupines may be confused with anemones (the little round sea creatures with spikes all over them). 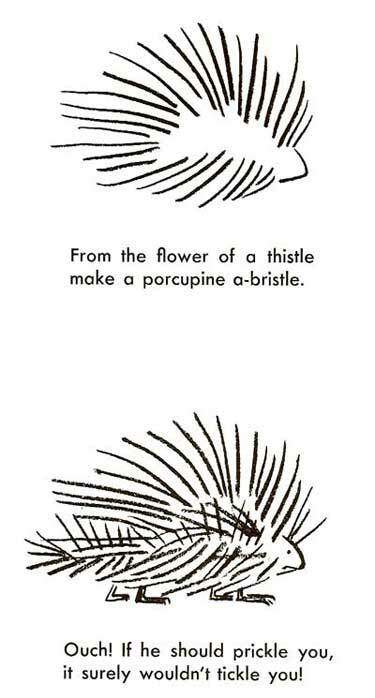 The best way around this is to make the porcupine's head visible in your drawing, like the lesson below shows. Adding little black feet will also help.